My teacher and me were arguing wether the big bang was real or not, and if god actually did create the Earth. I told him that if god actually created the earth, the odds are better if the flying spaggeti monster did it. He said that the big bang would’ve created mass, time, space, and energy. 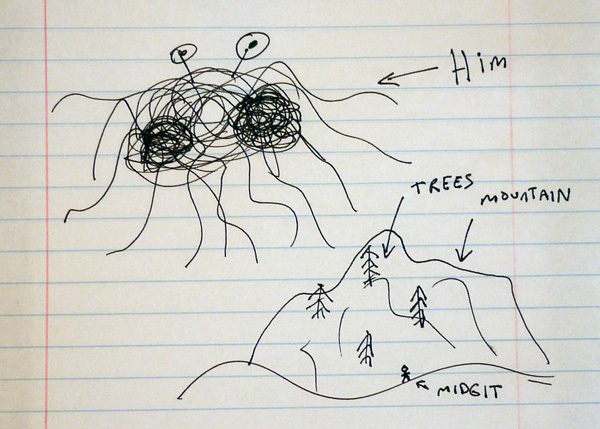 So, since the spaggeti monster is part of mass, it couldn’t have. Then he asked me if I belived that there were such thing as a moral law that all of us know. I said yes. And he asked me if the world created mass, time, space, and energy, where did the moral laws come from? HELP ME!! I need to confront him again. The pastafarian position is obviously absurd. Your friend’s argument is absurd too, but it’s not quite as obvious because it is dressed in the venerated clothes of religion. According to him, having mass-energy prevents a deity from creating the big bang. Why not the opposite? Wouldn’t you need mass-energy in order to create more? On the other hand, his position is self-defeating: God’s beginning was prior to the existence of God-stuff, so of course God can’t have made itself. More to the point, if all things need a creator, then who created God? If God wasn’t created, then why does the big bang need a creator? Isn’t it possible that the mass-energy was just hanging around for eternity waiting to explode in the Big Bang? Your friend needs to explain why mass-energy can’t be eternal or how God can create something that always existed. As to “moral laws”: if there were immutable moral laws independent of history (and I’m not sure there are), they could only be immutable because human biology and psychology are determined by our genetics and physical laws. Morality is dependent on human biology; if humans had evolved differently, moral laws would be different. There is no need to introduce a deity to explain what arises by itself out of nature. The moral sense in humans that you speak of comes partly from evolution and partly from cultural forces. We are social animals who are weak in nature (compared to tigers and lions and such) by ourselves, but very capable in groups. Humans who could sympathize with others and get along survived and procreated within those groups, while those who couldn’t or wouldn’t were shunned, banished or killed. Thus nature selected for humans who could sympathize with others and get along. While evolution has played a large role in human moral sensibilities, human cultures also play a role. For example, slavery has not always been considered immoral. Most atheists, I think, believe that human cultures have matured through history, and continue to mature. The treatment of women and blacks in this country are good examples of this. Women and blacks were prevented from voting and lacked other rights that white men had, but as our culture matured, more and more of us have insisted on equal rights for all. Our problem with the god of the Bible is that he is claimed to be a perfect being and should thus have been possessed of complete maturity from the beginning. It took us humans several millennia to realize that slavery was wrong, but a perfect god should have known this even in biblical times. A perfect god should ALWAYS be more moral than humans, but the god of the Bible clearly isn’t. The problem with assuming that whatever god does in the Bible must be moral because he’s god, after all, is that one’s moral sense can become dangerously warped. If non-belief in Jesus is really a sin, and morally wrong, then the burning of heretics makes perfect sense. It appears to me that the further we humans get from the morality of the Bible, the more moral we are. The Bible commands the death penalty for homosexuals, disobedient sons, witches, adulterers, and people who work on the Sabbath. None of those are in our laws, however. It certainly looks to me that we modern humans are much more morally mature than the ancient men who wrote the Bible.